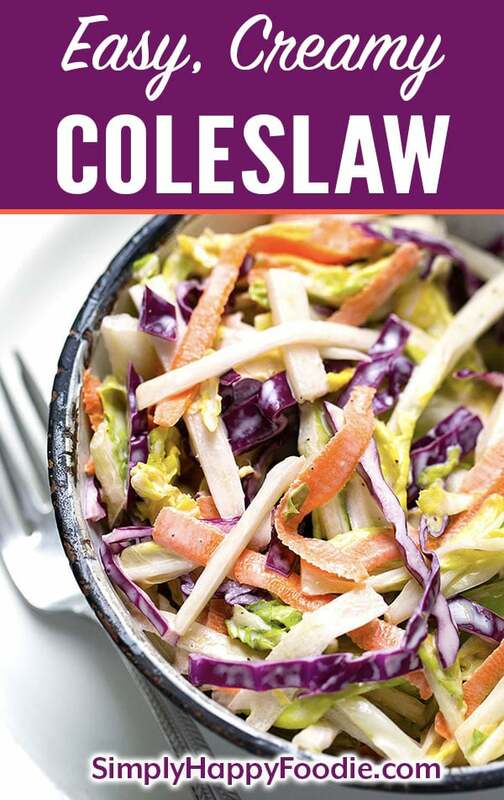 My Easy Creamy Coleslaw recipe is exactly as I named it. Easy. Creamy. Coleslaw. I like when a recipe is simple and turns out delicious. It’s like the K.I.S.S. theory: Keep It Simple Slaw, or something like that! I know, groan. I do love a good pun! Since it is Summer, and I am feeling happy that the sun is shining, and Gizmo is snoozing (and snoring) lazily at my feet, I’m thinking about Summer food. 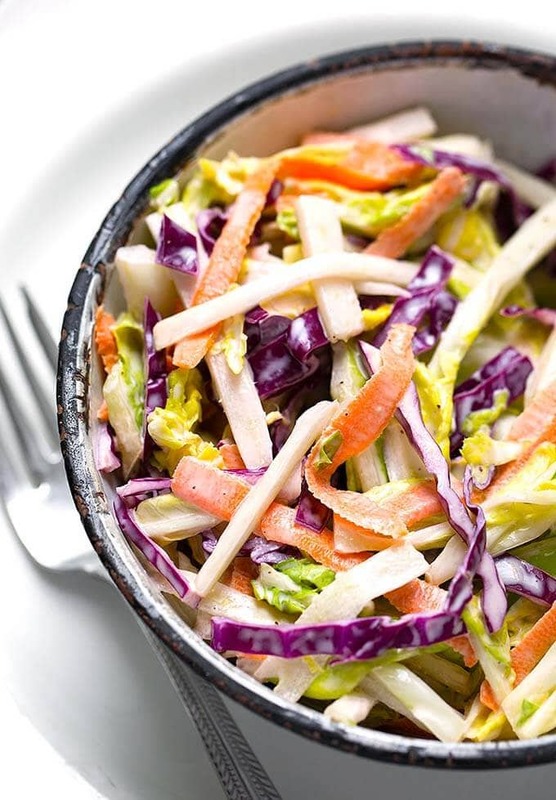 Picnic and BBQ dishes, fruits and veggies, and some lighter fare, like my Easy Creamy Coleslaw. Eating seasonally is easier when you have things ripening all around you. Here in Western Washington, it doesn’t stay warm and Summery for as long as we’d like, and our local growing season has a short life. It’s a good time to hit the farmer’s markets and gather the many offerings from our wonderful local growers! I’ve already made a few trips and my fridge is filling up. Maybe a little too full! So today I made my Easy Creamy Coleslaw to put on top of the Pulled Pork I made yesterday. YUM! Such a simple coleslaw. I don’t always want to make a complicated salad, and this Easy Creamy Coleslaw only has three veggies in it. You could certainly add more if you want to. The creamy dressing is also really simple, and has a nice little tang to it. I think Gizmo and I need to get out and take a nice leisurely stroll in this beautiful sunshine! Dinner is all set! 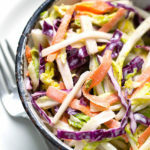 A classic creamy coleslaw recipe that is tasty on its own, or piled on top of a pulled pork sandwich. Just a bit of tang to keep it from being boring! Prepare vegetables and put in a serving bowl. Mix dressing ingredients together in a small bowl. Wait a couple of minutes to taste test as the Kosher salt needs time to dissolve. Then taste and adjust seasoning to taste. Dress the salad right before you serve it. Any extra dressing, if you have it, can be kept in the fridge in a sealed container for a couple of days. I have halved this recipe when making a small amount of coleslaw, and I have doubled it when making a larger batch.